Nurse Jobs in UPUMS University of Medical Sciences Recruitment 2018. Last date to apply online is 12-11-2018. Copy of online Filled application to be reach to the office of Vice Chancellor, U.P. University of Medical Sciences, Saifai, Etawah-206130 (U.P) by speed post/registered post/courier till 20-Nov-2018 5:00 PM. 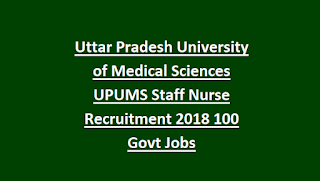 Uttar Pradesh for this UPUMS Staff Nurse Recruitment 2018 official website is recruitment.rimsnr.ac.in or www.upums.ac.in. Age limits, selection process, application fee, how to apply online and other details are given below for this University of Medical Sciences Staff Nurse recruitment 2018. There are total 100 Staff Nurse jobs in this UPUMS recruitment 2018. As on 12-11-2018 age limits are 40 years for Male Staff Nurse jobs. B.Sc Nursing of GNM Diploma qualified male candidates are eligible to apply online for this UPUMS recruitment 2018. Pay Scale is Rs.44900-142400/- for UPUMS staff nurse posts. Candidates selection will be based on written exam or interview for this UPUMS recruitment of Staff nurse jobs. Must have 3 years work experience in any medical college or medical hospital. Must have registered with State Nursing Council. 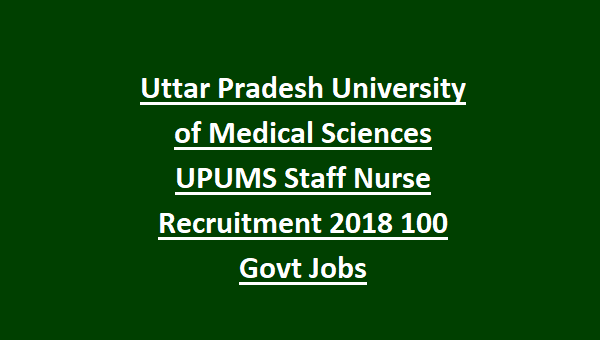 Interested candidates can apply online for this UPUMS recruitment 2018 before the closing date of 12-11-2018 for these Uttar Pradesh University of Medical Sciences Staff Nurse jobs. Download Submitted copy of application form and send it to the UPUMS along with all required attested copies before the closing date of 20-11-2018.